“A MOMENT” is the newest performance work from N’Cognita. It attempts to project to the audience the deeper implications of our simplest actions and how they can alter the course of our lives. The slow-motion quality of Butoh movements allow the viewer to notice infinitesimal details and her smallest gestures. This will be the first public viewing of this work still in development. Its final form will be presented at Judson Church in January. 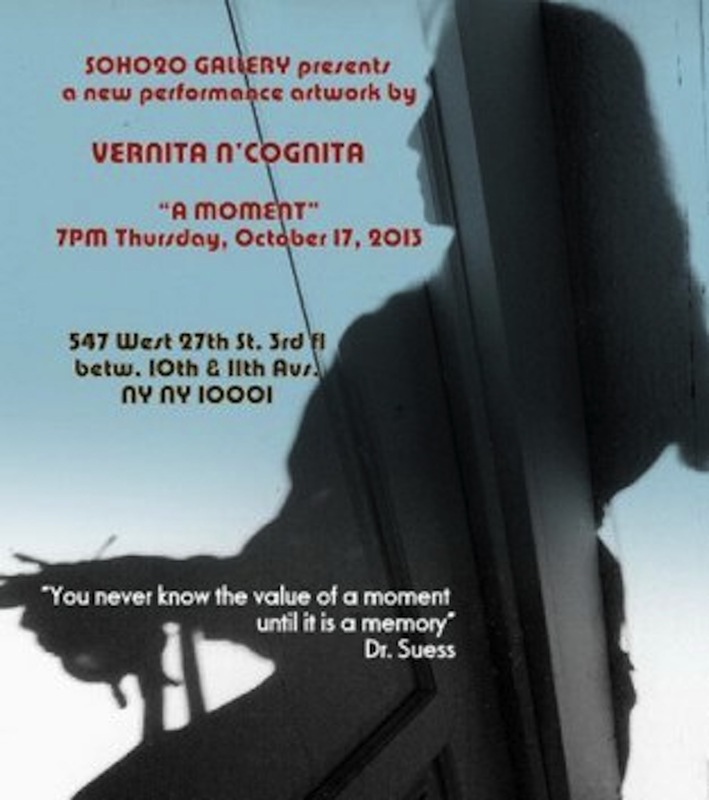 Vernita Nemec AKAN’Cognita began performing in conjunction with her visual practice in the late 70’s. One of her earliest performances, “Humorette”, occurred at Soho20 in 1978 in conjunction with her solo exhibit & installation there. She has studied Butoh and performance theory with many noted Japanese & American performers including Eiko of Eiko & Komo, at PICA in Portland OR with Deborah Hay & Akira Kasai, and most recently Body Resonance at Schloss Broellin in Germany with Yumiko Yoshioka. Butoh adapted forms an important aspect of her performance work. Nemec, also known as N’Cognita to honor underknown artists, has presented more than 70 performance in the United States, Hungary, Japan, Ireland, Germany, Mexico and France, including guerrilla performances at the Pompidou Museum in Paris, Documenta 13 in Kassel, and more than 20 solo exhibitions of her mixed media collages & installations in the United States, Ireland and Hungary. Her visual art is in the collections of MOMA, the Savaria Museum in Hungary, Sylvia Sleigh Collection of Feminist Art, Rowan University, Asian American Art Center, Franklin Furnace, Groupa Junij, Belgrade and others. ￼Articles and reviews of her work have appeared in the New York Times, The Village Voice, High Performance, Nation Magazine & the New Yorker among other publications. Her performances can be seen on UTube and Vimeo. She is included in “The Power of Feminist Art”, 1994, Harry Abrams (Pub), edited by Norma Broude & Mary Garrard, “The Pink Glass Swan: Selected Feminist Essays on Art”, 1995, Lucy Lippard. and “Performance Artists of the 80’s” by Linda Montano. She currently lives and works in New York City.